Take the commuter train from Arlanda airport towards Stockholm and get off at Helenelund railway station. Then walk ca 10 min. Taxi Kurir, Taxi 020 (note that each company has different queue of cars and that prices vary). Always ask for a fixed price to Kista (ca 420-450 kr). From the western suburbs take E18 and take off at exit number 279, junction to Kista, to Rinkeby. Follow Kymlingelänken to the exit towards Kista Centrum. 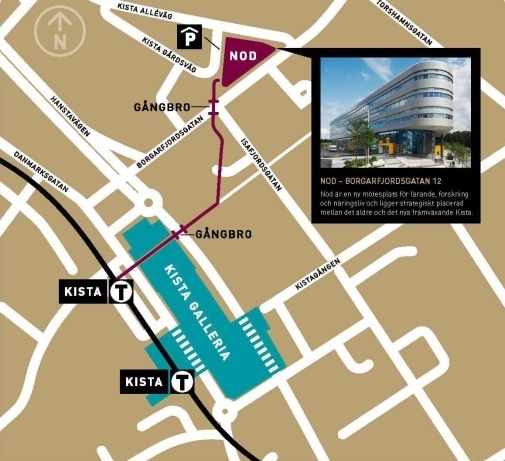 At the Kista roundabout, take the first junction to Kistavägen. Take the left to Isafjordsgatan, and take the right to Borgarfjordsgatan. Monday the lunch and reception will be at NOD (the same building as BIR 2018). Tuesday and Wednesday the conference lunch will be at PUUR restaurant. It is located on the entrance floor inside Electrum building. Electrum building is three minutes walk from NOD building where BIR 2018 is. 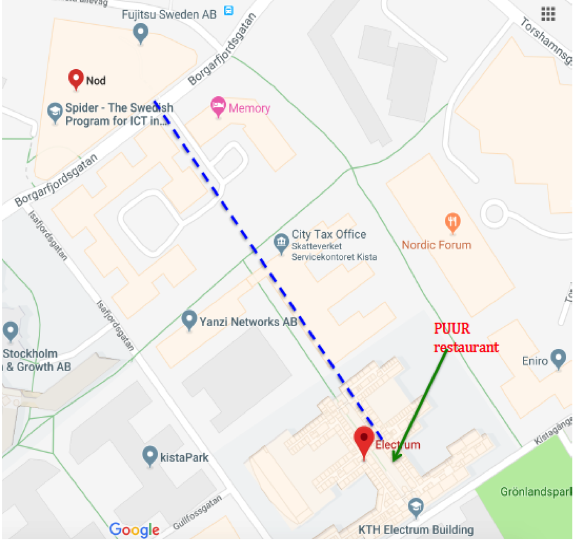 This is the address for PUUR:Electrum PUUR, Kistagången 16. The map to walk from NOD building to PUUR is at the end of this page.